Chef Lynn Crawford is passionate about cooking in her busy restaurant, but when she has time off, nothing beats cooking for family and friends in her own kitchen. Simple, real home cooking that’s full of great flavour is the secret to Crawford’s favourite everyday recipes that she serves at home. Here, she offers sure-fire recipes that she makes over and over because they’re crowd-pleasingly delicious and keep things easy in the kitchen. From Sunday brunches to grilling to cocktails and desserts, Chef Lynn has got you covered. You’ll find a wide variety of one-pot dishes such as Smoked Salmon and Potato Chowder and perfect sweets like Banana Fritters with Coconut and Coffee Caramel Sauce. At Home with Lynn Crawford includes beautiful photography of the finished recipes to inspire you to keep it simple and enjoy time in your kitchen. Lynn Crawford’s Pitchin’ In chronicles Chef Lynn Crawford’s road trip across North America, describing the people she meets, the land, and of course, the food. She travels from the Bay of Fundy, where some of the finest lobster in the world is caught, to Vancouver Island to haul in trap after trap of the best Dungeness crab available, to Kansas, where a small group of farmers is reviving heritage turkey, to Perth County in Southwestern Ontario, famous for some of the best pork in Canada and home to one of only a handful of farmers who are raising wild boar. In Lynn Crawford’s Pitchin’ In, Crawford shares many of the amazing and simple recipes from her adventures and celebrates the local food heroes she meets along the way. She gives us her best food and cooking tips and recipes for many of her favourite dishes to enjoy with family and friends. Recipes include Cider-Glazed Pork Chops, Creamy Chicken Paprika, Honey Butter Roasted Scallops, Mac ‘n’ Cheese ‘n’ Wild Boar, and Lamb Shepherd’s Pie. And she doesn’t forget wonderful desserts to top off every meal, such as Pecan Blueberry Cobbler and Red Velvet Cupcakes. 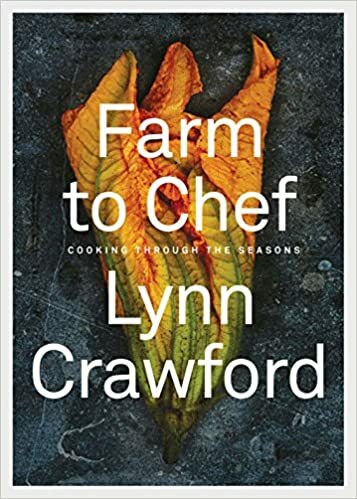 Chef Lynn Crawford celebrates the bounty of the seasons with over 140 recipes featuring farm-fresh produce for every occasion. Whether you’re braising, roasting, baking or preserving an abundance of produce, these recipes will offer immediate inspiration. Lynn shares her go-to favourites, like Harvest Apple Pie, Primavera Pizza with Ramp Pesto and Zucchini Bread with Walnut-Honey Butter, and new takes on the classics, including Butter Chicken with Rutabaga, Morel Mushroom Panzanella Salad, and Fennel Gratin with Feta and Dill. In the autumn, curl up with a warm bowl of Carrot Lemongrass Soup with Ginger Pork Dumplings, but when the weather heats up, enjoy Grilled Flank Steak with Charred Beefsteak Tomatoes and Blue Cheese. With something for everyone and beautiful photography throughout, Farm to Chef celebrates the bounty of the seasons and will become a mainstay in your kitchen. All cookbooks are available at Ruby WatchCo. “Winterlicious takes full effect this week. It got me thinking about all the Toronto restaurants ALSO offering prix fixe menus, either during this time or throughout the year.They deserve serious love too. Especially since meals start at just $20 per person. Instead of doing another roundup of Licious restos you should visit (Zzzz), I went in search of more.